It’s February, which means Valentine’s Day, which means being inundated with articles about love and relationships. While there’s plenty to discuss in regard to romance in your work, today I’d like to talk about something a bit more existential: your relationship to your work. Why do you write? Do you love it? Dorothy Parker infamously said, “I hate writing, I love having written.” That quote resonates with many writers; the process can be torturous. And we all have aspects of writing we love more than others—some people are idea machines; others live for revision. But regardless of which stage you prefer, it’s worth pausing to figure out specifically what it is about writing that you love. I bring this up because it’s easier than ever to get discouraged as a writer. The bar to traditional publication is high, and there are enough works being self-published that it’s tough for any one title to find its readers. I’ve talked to many writers who, after querying several books, have decided to put writing on the back burner. It’s understandably difficult to keep investing time and energy into something with minimal rewards. Evoking a full-sense memory of a place you once visited. Bringing two characters together to kiss—finally. Crafting the perfect turn of phrase to capture an emotion both specific and universal. Making yourself cry with an emotional scene. Solving the plot problem that’s been nagging you for weeks. These small victories may pale in comparison to your big dreams—but these little moments of joy are the only things entirely in your control. So I urge you to savor them, celebrate them, consider how to generate more of them. If you cultivate these feelings of love for the work itself, that could be the thing that keeps you going. This month’s newsletter will offer suggestions for falling back in love with your work in progress. But in the meantime, please feel free to share in the comments your reasons for writing and any little things you love about it. We’re almost halfway through NaNoWriMo! From what I’ve seen of your check-ins on Twitter, you’re doing an amazing job. But maybe you’ve been downplaying your check-ins because things aren’t going as well as you’d hoped. Or maybe you aren’t participating this year. Wherever you’re at, like I tweeted a couple weeks ago, writing quickly is a specific skill, and it’s one you’re likely to need at some point in your writing career. (Deadlines are real, friends.) So here are six ways to speed up your writing—and for those of you who just write more slowly than others, two reasons why that’s absolutely okay. 1. Experiment with your surrounding. Think about everything around you and how it might affect your writing speed. I write more quickly with music, for instance, but only—this is a very important caveat—if it’s music I don’t know. Even instrumental music that I know too well can start to infiltrate my brain. So I’ll listen to an album for the first or second time or bounce among classical playlists on Spotify. I also tend to do well in coffee shops or other public spaces where there’s a reasonable amount of ambient noise but not anyone I know. It’s easier for me to be lazy at home. But maybe you need absolute quiet and your special chair. And think about that chair. Is it working for you? 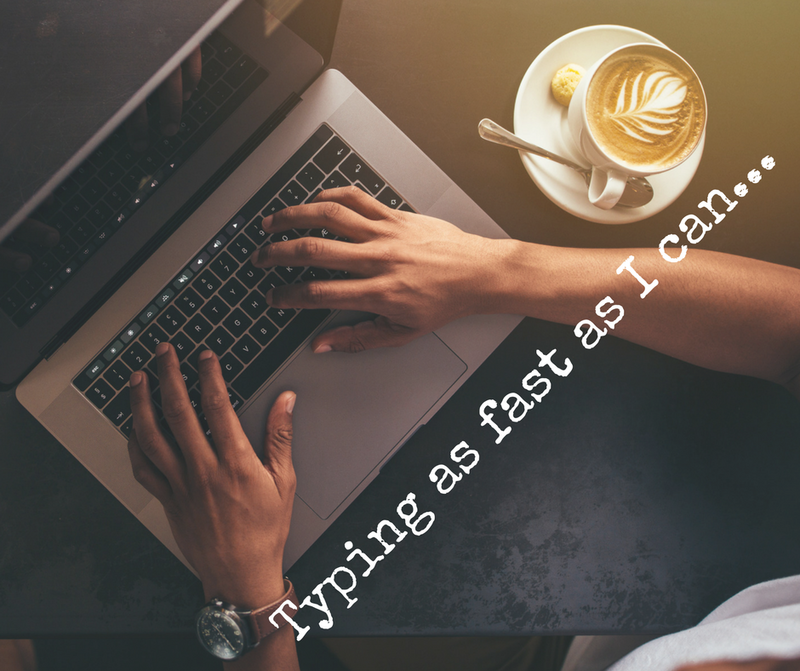 Would you write more quickly if you were slightly less comfortable? What about standing at a counter for a sprint? Maybe try changing the lighting or the temperature. At what time of day are you sharpest? (I’m hopeless for a bit after I eat.) Everything in your environment affects you, so if your writing starts to lag, change it up. I love writing sprints; setting a timer and shutting everything else down is a great way to focus. In addition to setting a time limit, though, try setting a word count goal. Challenge yourself (or a friend) to knock out more words than you ever have before in 30 minutes. Drawing on your sense of competition might make the words flow faster. And even if you’re not sprinting, it helps with goal setting to break a goal into more manageable chunks. 2,000 words a day may seem challenging to you. Instead, try focusing on writing 500 words before 10 AM. 3. Make notes about what comes next. Set yourself up to make the most of the beginning of your writing time when your focus is at its peak. At the end of every session, make a few notes about what comes next so you don’t waste time getting re-oriented. It can also help to separate brainstorming time and writing time. For example, I made notes on my phone about what I wanted this piece to say before I pulled myself out of bed this morning, so when I sat down to write this afternoon, I was ready to go. And as cliché as it may be, the shower really is an excellent place to work out plot problems. 4. Skip what you don’t know. Did you ever watch the $25,000 Pyramid? The players worked in teams; in each round, one would give clues to the other, trying to get them to guess a word. The player guessing could pass; the one giving the clues couldn’t. And sometimes the person guessing would just get completely stuck, running out the clock, while their partner leaned forward, face red, eyes pleading with them to just PASS and try to score points with the other clues. You know where I’m going with this—sometimes it’s okay to pass on a word, a scene, a chapter. All the words have to get written eventually, but they don’t have to be written at a certain time or in a certain order. It’s fine to write, “KISSING SCENE” or even “SOMETHING BAD HAPPENS.” I like to use all caps and the highlighter, so I don’t forget to go back. And if you want to get fancy, TK is journalist speak for “to come.” CONCLUDING LINE TK. When I’m trying to figure out what comes next, my eyes often drift over what I've already written. And then before I know it, I’m editing instead of writing. Instead, try looking into the distance when you’re thinking about what comes next. If you get really stuck, take a walk—around the room, your house, or the block. And if things get really dire, open as many Word docs as you need. A new document for every damn paragraph if you have to! Just copy and paste what you’ve written into your primary doc—and please, don’t forget to press save. 6. Don’t look at what you’re writing. When you’re really trying to get the words out and struggling with the desire to self-edit, try not looking at what you’re writing at all. Yes, you’ll have more typos to correct later, but it keeps you focused on writing what comes next instead of perfecting what you just wrote. Once, during a law school final that lasted eight hours and would be partially judged on the amount I was able to produce, I wrote for a solid half hour with my head down on my desk. I was exhausted, I had little time to worry about what I was saying, I just had to keep typing. (I wrote 28 pages and got an A, for the record.) For a more ergonomic experience, try covering your screen with a towel. Hope these tips help in the second half of NaNoWriMo. If you have any other suggestions, leave them in the comments below! 1. You may save time in the long run. Pounding out 50,000 words in a month will get you a draft, but a draft is just the beginning. Everyone has to revise, but if you write more slowly, your first draft might be further along than your speedier friend’s. I tend to edit as I go myself—which is a problem sometimes, particularly with longer pieces, but it also leaves me with a fairly clean first draft. 2. Trying to write more quickly could be counterproductive. It’s easy to get caught up in the NaNoWriMo excitement, especially if most of your writing friends are participating and you’re watching their word counts tick upwards on Twitter. If it inspires you to write more, that’s awesome. But it may also stymie you, with the pressure to write more than you comfortably can keeping you from writing anything at all. If that’s the case for you, feel free to take a Twitter hiatus in November. Go in your writing cave, and focus on producing words at your own pace. Because that’s really what matters in the end. Whether you’re participating in NaNoWriMo or not, whether you write 5,000 words a day or 50, you just have to focus on getting your words on the page—that’s the first step, before you can get to revision and publication and a lifetime of accolades. And each time you sit down and write, whether those words end up in the book or not, you’re becoming a better writer. They’re good dogs, Brent, and they’re all good words.